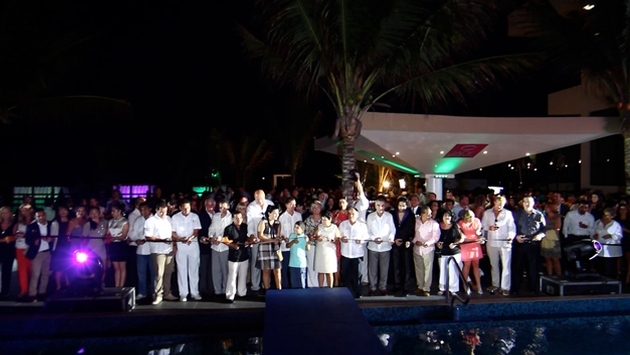 Karisma Hotels & Resorts, renowned for its Gourmet Inclusive Experience that is designed to provide guests with the finest gastronomic experiences, world-class service, innovative programming, and exceptional levels of quality, hosted a grand opening celebration for its newest and most luxurious property, Generations Riviera Maya, on May 5, 2014. With more than 350 attendees, the lavish event featured Cirque du Soleil style acrobatics with a performance by Backyard Circus, contemporary music by a saxophone player, and speeches by Karisma Hotels & Resorts’ executives, including owners Dolores Lopez Lira and Jose Luis Martinez, President Rafael Feliz, and Vice President of Sales & Marketing Mandy Chomat. Foodies were treated to four beachfront stations, each representing one of the resort’s innovative restaurants. Notables in attendance included Jeroen Hanlo Vice president of Food & Beverage; Sasa Milojevic Vice President of operations; Lubo Krstajic, Executive Vice President of Sales and Marketing; and Edilbrando Perez, Chairman, Karisma Hotels and Resorts. The latest addition to the newly-launched Generations Resorts by Karisma brand, Generations Riviera Maya features 144 all-suite oceanfront accommodations – the largest in the Riviera Maya at 1,200 square feet – with unlimited butler service and unmatched personal attention, an Eko Kid’s Club and Baby Beach Lounges, and swim-up infinity suites up from the first to fourth floors. As part of the Gourmet Inclusive Experience, Generations Riviera Maya includes gourmet à la carte meals at its four beachfront restaurants and two bars, premium alcoholic and non-alcoholic beverages, and 24-hour room service. Offering the highest level of customized service, Generations Riviera Maya is located on secluded beach only steps from El Dorado Casitas Royale facing the beautiful Mexican Caribbean. Generations Riviera Maya is synonymous with luxury and perfectly suited for multi-generational families, couples, and wedding parties seeking quality time together while vacationing in the heart of Riviera Maya, Mexico. Nightly rates for Generations Riviera Maya begin at $289 per adult, per night based on double occupancy and $67 per child, per night for 2014, including the Gourmet Inclusive Experience featuring gourmet à la carte meals, premium alcoholic and non-alcoholic beverages, 24-hour room service, and full service concierge. Rates are inclusive of taxes and fees. Hotel reservations can be booked through a GI Vacation Consultant, by calling 1-866-527-4762, or by visiting www.karismahotels.com.